Negotiation is our passion and we love sharing it with others. Through our research, we have spent decades trying to understand its complexity. We have used what we have learned in teaching generations of students and business executives across the world how to produce wise and sustainable agreements. As part of these efforts, we have also initiated an annual international negotiation competition for graduate students called The Negotiation Challenge. It offers participants a unique opportunity to compare their negotiation skills, live their passion and network with like-minded colleagues from around the world. The Negotiation Challenge has been an amazing opportunity for us to observe and interact with some of the best student negotiators in the world and analyze the secrets of their superior performance. The Negotiation Challenge, the competition as well as this book, has its origins in our desire to help our students, the leaders of tomorrow, become better negotiators. Since conflicts are an inherent and inescapable part of our lives, we must learn howto manage and resolve them. Indeed, now more than ever, our world needs skilled negotiators who understand not only how to navigate difficult negotiation situations, but also how to engineer value and craft smart and sustainable agreements. However, teaching these skills is a great pedagogical challenge. For example, how do we optimize our classroom teaching to generate the best possible results or how can we help our students become the best negotiators they can be? In addition, although comparing students’ negotiation skills before and after a negotiation class delivers valuable insights concerning the efficiency of our teaching methods, this environment lacks the revealing dynamic that a real-world situation has. That is, have the skills they have learned also work outside of the classroom setting? Thus, letting students compete at The Negotiation Challenge puts their negotiation and our pedagogical skills to the ultimate test and helps us answer these questions by seeing how our best students perform when faced with world’s best student negotiators. During the last decade of running our competition, the participating students, as well as their coaches and professors, have regularly asked us for our advice and guidance concerning the most effective preparation for The Negotiation Challenge. Although we have openly shared our observations with them, many have also encouraged us to publish the negotiation simulations we have written for The Negotiation Challenge to make them available for those considering participating in the competition. Thus, although this book has been long overdue, we are very happy to finally satisfy these requests. The remainder of this book is structured as follows. 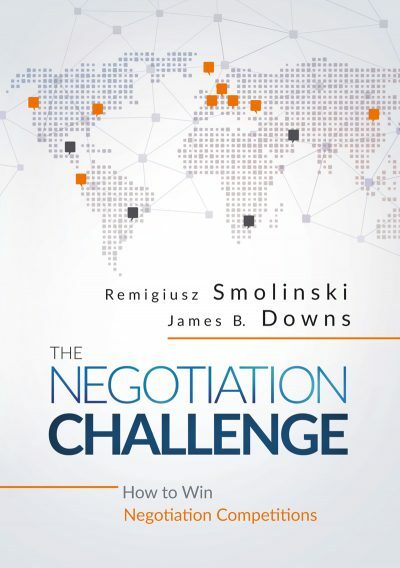 Chapter 2 describes The Negotiation Challenge as a competition. It explains how and why it started. It also describes its structure and discusses the evaluation criteria that we use in an attempt to capture and measure what we term negotiation intelligence. In this part of the book, we also give details on the competition’s admissions criteria that applicants need to fulfill to compete in The Negotiation Challenge. We conclude this chapter with facts and figures from past competitions including the list of hosting institutions and the winning teams. Chapter 3 then addresses four key types of negotiation, each as an independent section. These include distributive negotiation with value claiming strategies and tactics, integrative negotiation with value creation strategies and tactics, complex multi-issue negotiations, and multi-party negotiations. Importantly, each of these sections includes four supporting roleplay simulations, which negotiators can use to develop and reinforce their skills in preparation for The Negotiation Challenge or other negotiation competitions. These 16 roleplays are carefully selected role simulations that were written for and used during previous Negotiation Challenge competitions. Chapter 4 concludes this book with our advice and recommendations for potential participants of negotiation competitions to consider. We do hope that our suggestions will both improve the chances of admission for applicants and enhance their performance during the competition. We acknowledge that there are already many great negotiation textbooks available on the market that systematically reveal important research findings about negotiation and in turn help us understand its complex nature. Based on solid research foundations, these textbooks present well-structured empirical insights, derive useful theories, and present pragmatic tools and frameworks. However, what is missing in this collection of literature is a resource that helps one apply and practice these lessons. The goal of this book is to fill this gap. As firm believers in experiential learning, we wrote this book to offer students or anyone ready to be a better negotiator an immediate opportunity to apply and reinforce their negotiation knowledge through roleplay simulations. As such, we hope that this book with its carefully selected practical exercises offers readers an opportunity to improve their negotiations skills. In turn, we hope it helps them to negotiate smarter agreements and, even if a little at a time, make our world a better more peaceful place. Or purchase a PDF copy of our book and receive it immediately delivered to your email address. A PDF copy is less expensive and preparing student copies is easier with a PDF version of our book.